1. 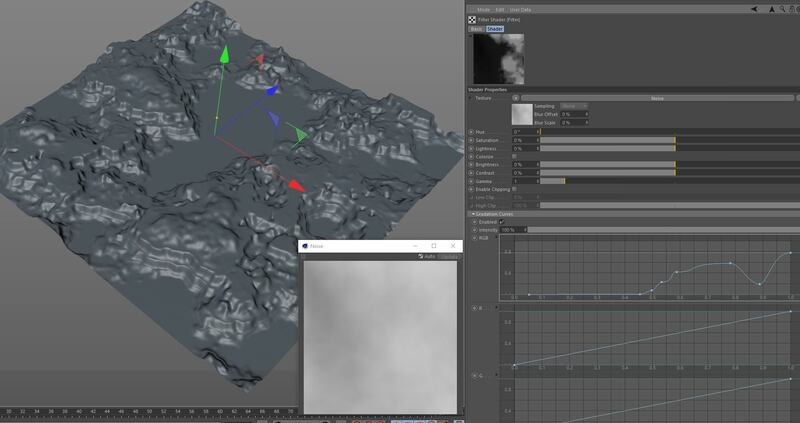 An interactive sculpt tool for shaping terrain. 2. Erosion controls - similar to World Machine. 3. FBX and/or Alembic import ability. 4. Import ROTATION offset for importing animated cameras. 7. More water types; i.e. ocean, lake, stream, river, rapids, waterfall, etc. I remembered another one, I think it would be great if you could sculpt the shape and size of clouds. Yep, lots of good ideas here. Many already suggested, which we keep in a private issue tracker. We're listening and will implement as much as we can over time. I can tell you we are almost certainly never going to support Vray shaders though. Other than that it's all probably fair game. Sculpting is at the top of my list too. Erosion controls - similar to World Machine. Danniis Classic Erosion plugin is great - check it out if you haven't already. FBX and/or Alembic import ability. and Deep Exr, the missing link for seamless compositing with other renderers! I know I mentioned this somewhere else, but image planes!!! Alembic/MDD, whatever it takes to get displacement caches into Terragen. Think wind displacement for SpeedTree. Complete with instancing and offset capability. Graph Editor could use an upgrade. It's kind of painful in there. Are there any render functions that could be offloaded to the GPU? Be nice to have render rez previews rendered out of the RTP for shot placeholders in the edit. Alpha channels are sometimes not pure white. Comp gets fussy about that. Node macros(similar to World Machine) with customizable in/output ports. Also allow nesting. I believe macros will attract more users. Clips is not what I'm looking for. Allow every parameter where possible to be connected via nodes. Allow nodes that expect a single scalar value(such as Noise scale/seed) to be typed into the fields of that node without the need to create constants. Dual CPU support (sometimes it works, but mostly it doesn't on my machine). Load a heightfield and specify the dimensions in meters. Now it guesses the size by looking at the pixel resolution. Not sure if this is already possible. More value remapping nodes such as a bezier curve editor. This will allow fractals to be less generic looking and art directed. Populations workflow isn't as nice and fast as Clarisse pointcloud/scattering workflow. I'd love to see a pointcloud based system. Sometimes you want to scatter stuff in a volume, like meteors. The only way to fake that is scattering the population on a deformed grid. Better way to visualize the current node. The view of the small shader preview window cannot be translated. My personal opinion regarding Terragen: I find Terragen artist unfriendly. You often repeat yourself, can quickly create a big spaghetti mess and must have deep technical knowledge. You need more developers. The pace of development is quite slow. You're lucky E-on software does such a poor job, but nowadays I see many people switching to Clarisse from Vue. These could have been Terragen users. I do love that VDB import/export is underway and can't wait to use it in other applications such as Clarisse. I always wondered how sculpting would ever work in Terragen. I don't really see it being workable without a huuuuuuge overhaul of the preview system. I mean, think of working with just the painted shader. In general it's addition would put the system requirements into the flagship hardware realm. That is a fair point. This is something I've never requested yet bitched about to colleagues regularly. That being said, you say it's artist unfriendly... this year has been my introduction to Houdini. You go learn that now without swearing. Go on. Off you pop. This is likely an error in the file itself. Heightfields in .ter format, as well as GeoTIFF .img files contain metadata with heightfield dimensions. Now have fun doing the same thing with blue nodes. "Go on. Off you pop." I still think size information in files that don't follow the metadata standard should not be derived from the resolution. Let the user decide what the size is. World Creator currently has some issues exporting out large files with many file types and because of that I have to use PNG16. Scale maps: Controlling the scale of .obj populations with a painted shader or image map. An even better version of this would allow you to also use the min-max scale function within the population's parameters. So your populations would still have a random scale, but also would allow you to control areas of smaller and larger scaled objects within the same population. You can resize the heightfield with a Heightfield Resize operator, but we should probably duplicate that function on the heightfield load itself.